Muesli is a combination of oats, nuts, seeds, and dried fruit. Prepare it ahead of time by combining ingredients together and store it in the cupboard for a quick, go-to breakfast for busy days or an energizing afternoon snack. The whole grains, nuts, fruit, and spices make it a sweet, savory, and satisfying breakfast option. Top it on smoothies for a little extra crunch and nutritional-punch. Soak ½ cup of the muesli overnight in unsweetened plant-based milk of choice. In the morning, top it off with slices of bananas and berries. Enjoy it cold, or heat it up. 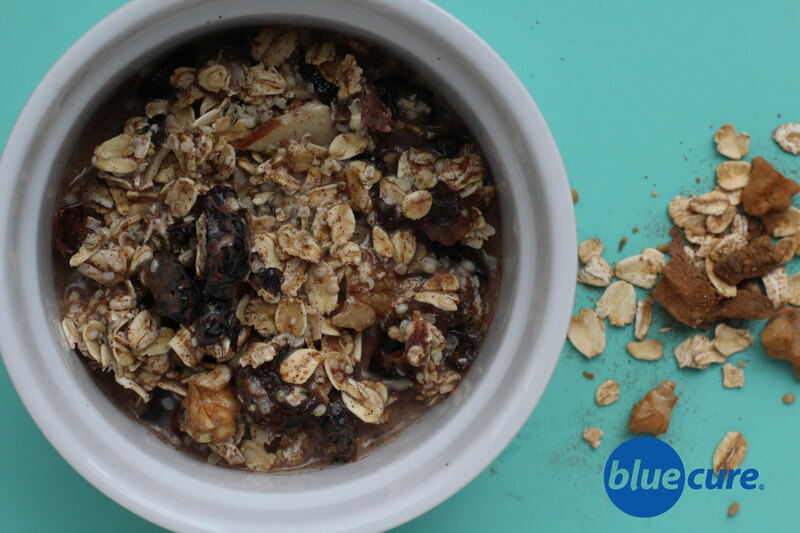 The muesli will be a sweet and easy treat for breakfast! Prepare the muesli like oatmeal by adding it to boiling water. NOTE: you can mix and match the seeds, nuts, and dried fruits– adding different combinations. Prep the ingredients. In a container combine all the ingredients, store in an airtight container in the cupboard for a quick and easy go to meal or a topper on your smoothies.